WEEKLY ONLY weekly only june july aug.
Our partially wooded lot on the lake offers a peaceful setting. The cabin includes many modern amenities to make your stay comfortable: a fully equipped kitchen, washer/dryer, spacious living room, and 2 car garage. In the cooler months, cozy up by the wood-burning stove in the living room. The master includes a queen size bed while the second bedroom includes a double size bed. There are also two hide-away beds to accommodate larger groups. Step outside the cabin to enjoy the deck overlooking Lulu Lake, a fan favorite. In the evening, gather around the campfire with friends and family. Soak up the sun on Lulu lake, popular for fishing, and non-motorized boating.The property includes a private dock on the lake plus a canoe and rowboat. Relax at our seasonal vacation cabin! Just outside the back door are a variety of hiking, biking, and snowmobiling trails. The cabin is just ten minutes from Shawano, Wisconsin which offers a variety of fun activities: parks, golf, casinos, restaurants, shopping, go-karting, the Mielke Arts Center for "Theater in the Woods," and more. 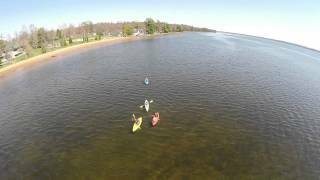 Or spend an afternoon at Shawano Lake - a popular destination for water recreation. Base Price for 6 People. *$50 each additional adult, $35 each additional child. Sorry, we do not allow pets, campers, tents, or ATV’s on the property.